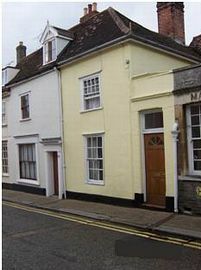 The property is a charming period town house, situated two minutes' walk from the town centre, located within the historic "Medieval Grid". With a wealth of original beams and historic features, the property includes a sitting room, dining room and galley kitchen. There is a ground floor bathroom and a secluded courtyard garden. Upstairs there is a double bedroom, a large twin bedroom and two single bedrooms. Bury St Edmunds is a delightful, award-winning, floral Market Town complete with a full historic backdrop to complement the growing cultural flavour that has gained world recognition! Bury offers an excellent range of amenities, including extensive shopping facilities,as well as a local Market held on Wednesdays and Saturdays. St James Cathedral, with its recently completed tower, and the Abbey Ruins, provide hours of entertainment for those of an historical bent! The recently restored Theatre Royal presents high quality plays performed by a variety of well-known actors. A fine range of pubs and restaurants, enhanced by a good selection of leisure facilities, including golf clubs, swimming pools, health clubs and other sporting activities, make Bury a desirable town in which to relax. 63,i Guildhall Street occupies an ideal location from which to appreciate fully all the town has to offer. Centrally located in historic Bury. Wealth of original features of interest in the property. Go past Tesco's and proceed along Parkway, past Firestation and Cinema over several roundabouts until you arrive at two mini-roundabouts. Turn left into Westgate Street and then 2nd left into College Street. Turn left into Churchgate Street following the one-way system. Turn left at the top into Guildhall Street. No 63 is on the left after the British Legion.